The Coleman 6-Person Instant Tent Review will cover the features, advantages, disadvantages and the alternatives so that you can decide or not to buy the tent. This tent has been around in the market for a long time. Yet it is still popular and people are still buying it. It’s more popular amongst car-campers and families. Because of its popularity, there are many mixed reviews stating the pros and cons of this product. With this in mind, I have gone through the feedbacks of this product and have summarized my findings in this article. Hopefully, at the end of the article, you will make your decision on buying the tent. The most complimented feature of this tent would be the pre-attached poles as they help to set up the tent fast. Some users also stated that they could bring the tent up alone. The built-in rainfly is an interesting add-on as you don’t have to spend extra time pulling a separate rainfly over to cover the tent. It’s also a thoughtful design to add two vents at the rainfly so to allow airflow and prevent condensation. The manufacturer also thinks of the user at night as it adds reflective guylines so that the user won’t wander around in the forest trying to find his/her own tent. You can easily judge the ease of setup by looking at this video. It lives up to its name as an instant tent. The frame is assembled. The poles have already been attached to the tent body. There is no need to lay out the poles, put them in pole sleeves or clip them to a frame. All you have to do is lay out the entire tent bring up the roof, extend the poles and you are done. Extending one corner of the tent tends to drop the other corner of the tent. It would be better if you get someone to hold the other corner so it won’t keep falling down. The tent is made of two thick Polyguard fabric which explains its durability. It should stand up against a rugged or rocky terrain. 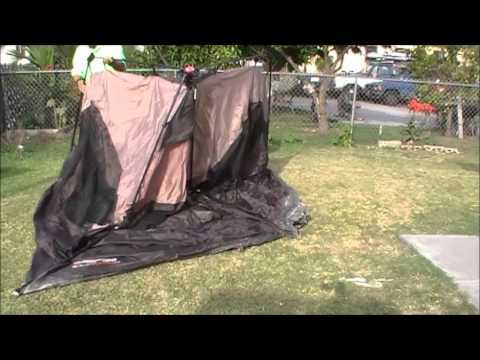 While it makes the tent durable, it poses the problem of condensation. As it uses a thick material, it also does not breathe well. You may also want to better protect yourself from the rain by applying a waterproofing treatment to the fabric before bringing it out. The poles seem really thick and strong. Some users stated that the poles didn’t snap even though they used the tents countless time, the tent could even hold up to strong wind. Staking in the tent will make it even sturdier and you will feel safer when there is a storm. However, some users reported that the stakes are really cheap and flimsy so you might want to think of getting better stakes than bringing the ones that come with it. The tent has inverted seams which are supposed to prevent water from leaking into the tent via the seams. However, some users reported that there is still leakage during a torrential rain. To be on the safe side, you may want to seal the seams if you know you are camping somewhere where rain is a frequent occurrence. There is nothing fancy about its design. It is in the form of a cabin tent that has the tent walls almost perpendicular to the roof. This creates high ceiling throughout the tent that also increases the livable space. This tent shape is beneficial for people who likes to walk around in the tent without crouching or bending down. There wouldn’t be problems changing clothes as well. The tent has a lantern loop inside that you can use to hang your night lamps. It has two interior mesh pockets that I think is not enough especially when you have a lot of people staying. Unfortunately, there is no e-Port. You will have to bring in your electrical extension cord through a hole in the door if you really want to bring in some electricity. There is a built-in rainfly in the tent that comes with two vents. 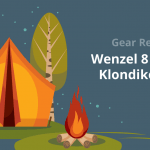 Once the tent is setup, the rainfly will also be there so you don’t have to spend additional time pulling another rainfly over to cover the tent. While this helps to lessen the time of setting the tent up, you will be solely be depending on it to protect you from the rain. You won’t be able to remove it as well. This is a bummer if you want to do stargazing at night. Some shops offer additional rainfly. If you really need to keep the tent inside bone dry, you can go for the option with the additional rainfly. The two vents at the rainfly can be opened by unzipping the two mesh at the top and then raising the prop to bring the flap up. This can be helpful to prevent condensation happening inside the tent during a cold weather. However, the props are flimsy that might not be able to hold up in a storm. Some users reported there was leakage during a torrential rain. The strong wind probably raised the flaps and allowed water to go inside the tent through the vents. There are 4 large windows on each side, including the one beside the door. They come with privacy screen. The screens not only protect your from exposing yourself to the world while changing clothes, they can also prevent rain from getting inside the tent through the windows. Air flows easily when all screens are not used and the windows are fully opened. By opening the vents and the windows, there shouldn’t be any issue for condensation. When the windows are shut and the vents are closed, condensation may happen as some users reported. The guy lines that come with the tent are also reflective. This is helpful if you are wondering at night trying to find your tent. In my opinion, this wouldn’t be a 6 person tent unless everyone wants to live like sardines. It is probably comfortable for 4 people max. Furthermore, there is only one door. You really have to look where you are going at night if not you may end up stepping on someone. This would be a spacious tent for a couple though. There is space for 2 queen sized air mattresses but some users reported that there is not enough room to move around after that. This tent seems to have some waterproof issue though, some users commented that purchasing an additional rainfly was necessary to keep the rain out. Some users said that the additional rainfly was not useful at all. After looking through the feedbacks, I would conclude that this tent would do fine in light rain. It may not be able to hold up against the storm. The tent has large windows and vents on the built-in rainfly which provide a lot of areas for the air to flow in and out of the tent. However, because of the thick fabric, there might not be much air coming through. I feel that this tent can still do decently in a hot weather since there are plenty of ventilations. The thick fabric can help to trap some heat inside the tent but may cause condensation issues as well. I would say this tent can do alright in a cold weather situation. This tent is almost identical with the Coleman 6 Person Instant Tent. The setup is the same, you lay out the tent, extend the poles fully and it is up. The shape is also similar to Coleman’s. The difference between the two tents would be the amount of pockets, windows, vents and the rainfly. CORE 6 Person Instant Cabin Tent comes with more pockets and 3 large windows. The rainfly is not built-in and the vents are at the bottom. CORE 6 Person Instant Cabin Tent is for people who is looking for an alternative to Coleman 6 Person Instant Tent but wants to have more storage compartment, the e-Port and the ability to do stargazing at night. However, you won’t be fully protected from the rain if you don’t leave the rainfly on. If this is a concern to you, the Coleman 6 Person Instant Tent would be the better choice. This tent is a smaller tent and accommodates lesser people. It is still an instant tent but the way to bring it up is different. You just need to unzip the carry bag, move the strap off the tent body and release it into the air. It will then open itself up and the tent is ready for use. It’s a dome tent so expect to have lower ceiling. The product description states the capacity for 4 people but some users argued that it just fit 2 people nicely. FiveJoy Instant 4-Person Pop Up Dome Tent is for couples and car campers who are traveling to a lot of destinations and wants a quick overnighter. Other people who are looking for a no hassle quick and easy set up can go for this tent as well. This is another cabin tent by the same company. The tent is bigger and more spacious. It comes with an optional divider to separate the tent into 2 rooms to create more privacy. I wouldn’t consider this as an instant tent as it takes more time to set up. The poles are not pre-attached, you have to lay them one by one and attach them to the tent body. You will also need another person to help out with the setting up. You can lay a rainfly over the top if needed or you can leave it out to have some stargazing activities at night. This tent breathes very well as there is so much mesh around. The hinged door is also a unique feature which allows easy entrance and exit of the tent. Coleman Hampton 6 Person Family Camping Cabin Tent is for families who don’t mind the hassle of setting up their tents. If you want more space, convenient entry/exit and the feeling of a hotel room in the outdoors, this would be a better choice than the 6 Person Instant Tent. This is a dome tent by the same company. Although it is a dome tent, the ceiling at the center is high enough. This allows one person at the center to be standing up straight without touching the roof. The set up also take some time as the poles are not pre-attached. You will have to extend the poles then put them in sleeves and attach the tent body to the poles. There is no problem setting it up alone. There is mesh all around. This makes the tent well ventilated and you can also enjoy stargazing at night. The rainfly that comes with it covers all the mesh. There is a vent at the bottom to allow airflow and prevent condensation. Coleman Sundome 6 Person Tent is for families who is looking for an alternative tent that provides better protection from the rain and better ventilation to reduce condensation. Space and height are great. The trade-off would be the set up taking a longer time. In my opinion, it is a safe choice to make the purchase. There are a lot of satisfied purchases for this tent although some users argue that it is not waterproof enough. By applying additional waterproofing treatment and sealing the seams, it should be able to protect campers from light rain. 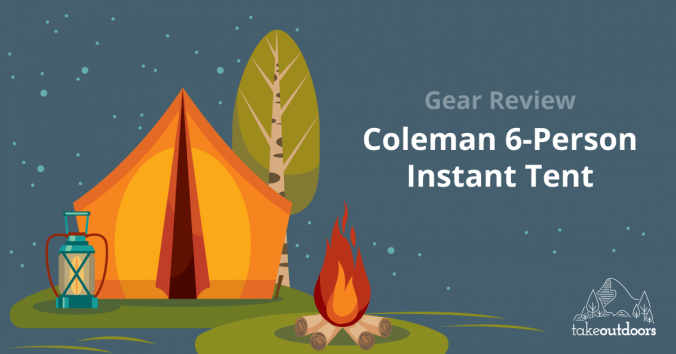 If you are looking for a quick overnighter or simply hate complicated setups, I guess the Coleman 6-Person Instant Tent is the right choice.